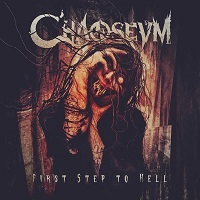 “First Step to Hell” is the debut album of Swiss quartet CHAOSEUM, which formed in 2018. The band members had performed together previously in symphonic/power metal band ELFERYA. Their new band, however, has no symphonic elements and can be described as metalcore. Recently, in the past few months, the band has signed to worldwide agency Metal Music Bookings and Management and due to this, they are set to tour in the US in 2019 with SOULFLY. The album opens with “Lilith”. The vocals are gritty and raw. Lola Van Loo has a tendency to fall flat on several sections of her cleans. The drums keep a quick pace behind the music but are often lost in the rest of the layers of music which don’t stand out from each other and just blend together creating noise. A part of this could be from the poor recording quality. “Don’t Waste Your Time” has a slow, 1990’s intro which quickly picks up the pace with Lola Van Loo’s growls and the drums driving fast and hard. Skipping forward to the fourth song, “Blue Scorpion” has vocal parts reminiscent of a symphonic power metal band but the rest of the music does not align with that feel. It has a much heavier, sludgy feel especially with the low growls in the background. “First Step to Hell” is the fifth song on the album. The moaning and atmospheric sounds in the background give it an eerie feeling at the intro. It picks up speed, sounding like a hard rock band. The vocals are very rough and gritty. “F.T.S” has verses that are very unique in their sound with layered vocals and a distinct voice. The heavy choruses break them up well. “New Dawn” is an instrumental song that begins very slow. It picks up the pace, with 80’s influence mixed with a grungy sound. “Kill or Be Killed” is very driving with Lola Van Loon’s growls starting the song. It moves to background chants and clean vocals with a Middle Eastern vibe. The final song on the album, “Between Two Lives” is another instrumental. This one sounds more like a ballad, very pretty and emotional. CHAOSEUM is a new band experimenting with new sounds. They tend to come out as a cross between metalcore and heavy rock. Lola Van Loo shifted away from the symphonic music sound in favor of a more raw sound. Unfortunately, some of the time, her vocals sound strained and painful and exaggeratedly rough. The production of the album is not top notch, with the sounds blending together so much in certain parts that it comes out sounding like noise with no ability to tell the instruments apart. Hopefully, with a little experience and advice, they will go a long way.